The Trump administration is bringing back a Bush-era diplomat to help resolve the war in Afghanistan. 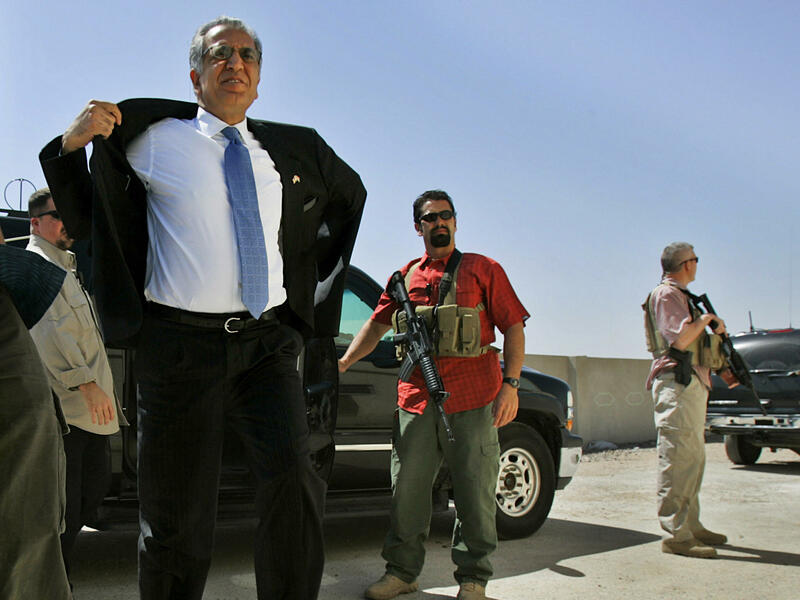 Zalmay Khalilzad is already on his first trip, even before he's been formally sworn in for the job. He's traveling to Pakistan and India, along with Secretary of State Mike Pompeo. NPR's Michele Kelemen reports. MICHELE KELEMEN, BYLINE: In his autobiography called "The Envoy," Zalmay Khalilzad writes about his immigrant story and his time as the Bush administration's ambassador to Iraq, Afghanistan and the United Nations. ZALMAY KHALILZAD: A lesson that I have learned from my years of dealing is that you have to be very careful about what you assume would be the outcome of very big struggles. KELEMEN: That was 2016. Now he may have to add a new chapter. The Trump administration has tapped him to help resolve America's longest war. In his birthplace, Afghanistan, he will lead efforts to promote reconciliation between Afghanistan's government and the Taliban. Robin Raphel, a former assistant secretary of state for South Asia says this is a sign that the Trump administration is getting serious about a political solution. ROBIN RAPHEL: That's important. And personally, I think it's long overdue because I think everybody realizes - and I include in this the Taliban - that things in Afghanistan are getting too fractured, that there are too many players and that Afghanistan really could become the next Syria if attention is not paid to the political as well as the military dimension. KELEMEN: Raphel has been involved in Track II diplomacy with the Taliban. And a current top State Department official has had recent contacts, too. This is something that Khalilzad could build on, Raphel says. RAPHEL: He's a very experienced guy. He knows the political and cultural terrain in the region. He's a gifted diplomat, so I think the potential is for him to bring a lot. RONALD NEUMANN: He's a great deal-maker, but I don't know if there's a deal to be made. KELEMEN: That's former ambassador to Afghanistan Ronald Neumann, who's worried about recent advances by the Taliban. He says, for now, they keep insisting they only want to negotiate with the U.S., and only about America's withdrawal. NEUMANN: At the end of the day, they have to be willing to negotiate with the Afghan government. We can't negotiate how Afghans will live with each other. KELEMEN: But Raphel sees some openings. RAPHEL: Their intentions need to be tested. It's long-past time that we did that and see how far we can get because I think they know they can't win militarily, and they're not going to be the sole governors of Afghanistan again. That's just not in the cards. KELEMEN: Khalilzad has a mixed reputation in the region. He's angered many in Pakistan by criticizing that country's role in Afghanistan. And he's seen as a one-man band. He comes to the State Department that has seen big cuts, including to the special representative office, which Daniel Feldman ran during the Obama administration. DANIEL FELDMAN: We had a whole cell working at the State Department of intelligence analysts and other career experts that were dedicated to trying to energize reconciliation that was dismantled at the beginning of this administration. But hopefully, Zal will be able to bring together experts again and think through a potential strategy and execute it as best as anyone can. KELEMEN: Secretary of State Pompeo says he's not planning to recreate that office. He says Zalmay Khalilzad has a singular mission - that is to find ways to get the Afghans and the Taliban to reconcile. Michele Kelemen, NPR News, the State Department.